Our expansive waterfront extends more than two miles around camp, and is navigated by our fleet of power boats, sail boats, canoes, and kayaks. We have a fully supplied sports complex for a wide variety of land sports including basketball, volleyball, and tennis. Our theatre is completely equipped for dramatic production. Our arts & crafts facility has jewelry making and ceramics. Our support facilities include the dining hall, a massive arena for sports, a social hall for get-togethers, a canteen, and an infirmary. 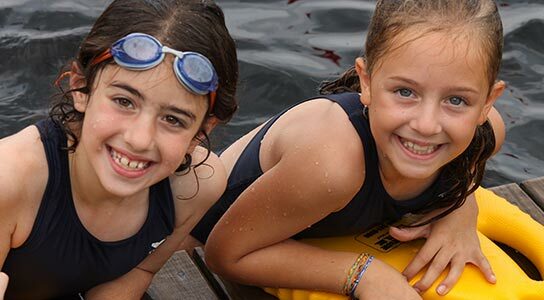 Raquette Lake Girls Camp has over two miles of waterfront on one of the biggest lakes in the Adirondacks, so it offers the most complete swim complex for Red Cross training and competitive swimming. The largest and most up-to-date fleet of Nautique ski and wakeboard boats, and a wide range of Hobie Cats, Sunfish, Laser, and Precision sailboats, are all available. There is a 27-seat custom fishing boat with a captain and first mate. In addition to this fleet there is a water slide, a water trampoline, a rope swing, banana boats, and tubes for all campers. The canoe dock offers canoes, kayaks, and paddleboards. Raquette Lake Girls Camp has a complete sports complex. Our facilities include outdoor areas for tennis, basketball, soccer, lacrosse, softball, ga-ga, and volleyball. There is a gymnastics gymnasium and indoor areas for volleyball and basketball. We provide access to local golf courses. There is a comprehensive arts program with ceramics, jewelry, and indoor and outdoor areas for arts & crafts. There is a new theatre for shows and musical reviews, and a stand-alone dance facility; both are directed by a professional drama company. Raquette Lake Girls Camp is located in the largest state park in the US, surrounded by thousands of acres of protected woodlands and 100 miles of shoreline; our camp offers the perfect setting for exploration and discovery. It has the largest climbing and ropes course in the East, and 46 high peaks in the Adirondacks for hiking and climbing. Every summer, each age group takes overnight canoe trips in the wilderness and day hikes in the mountains. The horseback riding program at Raquette Lake Girls Camp is managed by equestrian professionals; they provide riding instruction and guidance, and ensure the safety of every rider. Our facility has stalls for 20 horses, a main riding area, and an arena for beginners. We have all the equipment and facilities necessary for every aspect of horsemanship, from jumping to dressage. All bunks have been completely renovated and offer private bathrooms and showers. There are single and bunk beds available by request. Campers are responsible for daily cleanup of the cabins, and the bathrooms are maintained daily by our professional cleaning staff. Hot water to each bunk is provided by state of the art on-demand hot water systems. The centerpiece of camp is our dining hall which overlooks the lake. The dining hall can seat the entire camp for each meal. With seating for at least 2000 people, the arena is used for all camp events, intracamp tournaments, and occasionally for girl/boy camp get-togethers. The arena also houses indoor basketball and volleyball, Team Week events, and ceremonies. The campfire, which overlooks the lake, is the site of our weekly full-camp fire and various traditional ceremonies such as the first and last nights of camp. The camp social hall is our theatre. A musical show is performed there every Friday night. Also known as “TP,” it is the nightly gathering spot for campers, scheduled by age group, where they can find ice cream sundaes, popcorn, pretzels, foosball, or darts. We have a 2:1 camper to staff ratio, so each bunk averages 8 girls and 4 counselors. Cabins have private bathrooms and showers, and on-demand hot water systems. Each bunk is led by mature counselors who are always present to guide and support the campers. Cabin clean up, with daily inspections, is the responsibility of the entire bunk. A professional cleaning staff takes care of the bathrooms and showers every day. Bunks are supervised by their counselors 24 hours a day. Team Week: This is a week long competition between two teams, Blue and White, across most camp activities. Each camper will participate in numerous activities and events. July 4th: The 4th of July celebration combines the girls camp and boys camp for an All-American cookout and fireworks extravaganza. Hobby Night: Hobby night happens on Tuesdays and Saturdays. Girls participate in a special activity or hobby of their choice. Family Night: The girls camp and the boys camp get to spend the evening together and share activities on some Saturday evenings. Sister/Brother Lunch: Once a week, siblings from the girls camp and boys camp get-together for lunch. Trip Day: Every Thursday is trip day. All girls leave camp once a week for a special trip with their age group. Trips include: The Great Escape at 6 Flags, mountain hikes, overnight and canoe camping trips, Lake Placid, Lake George, Old Forge, and Montreal. Socials: Older campers from the girls camp and boys camp get together at the canteen for foosball, ping-pong, popcorn, drinks, etc. They can also enjoy dancing in the social hall. Each day consists of six activities: five structured and one elective. Led by their counselors, campers travel from activity to activity with their entire bunk. Every day begins with reveille at 7:30 a.m. and ends with taps at 9:20 p.m. The only days where the schedule differs are “lazy” Sundays and Thursdays (out of camp trip days). Among our oldest traditions, younger campers are paired with older campers for the summer. It’s a special bond of sisterhood that each girl shares. Camp sisters participate in a weekly dinner and evening activity.